Derby's waste - a rubbish blog ! : Hidden contracts! the public strikes back! Hidden contracts! the public strikes back! On 22nd October 2015 I Simon Bacon the writer of this blog applied to Derby City Council in Derby UK via FOI / EIR requesting the following information relating to the controversial joint waste contract linked to the highly controversial Sinfin, Derby gasification incineration plant. 1- ALL CONTRACTS BETWEEN DERBY CITY COUNCIL AND DERBYSHIRE COUNTY COUNCIL RELATING TO THE JOINT WASTE CONTRACT. 2- ALL CONTRACTS BETWEEN DERBY CITY COUNCIL AND ITS PARTNER DERBYSHIRE COUNTY COUNCIL WITH RESOURCE RECOVERY SOLUTIONS (RRS) AND / OR ITS PARENT COMPANY SHANKS / INTERSERVE. 3- ALL CONTRACTS RELATING TO THE USE OF THE SINFIN TANNERY SITE - OWNED BY DERBY CITY COUNCIL BY RESOURCE RECOVERY SOLUTIONS (RRS) OR OTHER PARTIES. Derby City Council responded on 17th December 2015 in which it disclosed some of the requested information but withheld some of the information in part 2 of the request claiming the adverse affect to the confidentiality of commercial information. 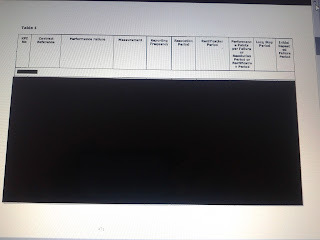 What was provided was a series of documents with many redacted (blacked out pages) where the council and its supporters - Derbyshire County Council and Resource Recovery Solutions edited the documents to hide certain aspects of the documents which they did not want the public to see. Here are a couple of examples from schedule 14 of the contract which covers the performance mechanism. 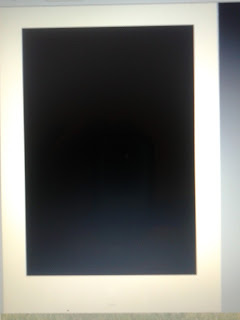 As you can see from the images when they redact information they really black it out! I appealed this ruling and Derby City Council carried out an internal review and responded to me on December 24th 2015 that it maintained this position. Having considered this battle of wills further I made a complaint against Derby City Council on 22nd February 2016 to the ICO - the Information Commissioner. The ICO then gave full consideration to my strongly put appeal while engaging with Derby City Council further. The council and its fellow contract members attempted to paint a picture which included impacts on interests of Resource Recovery Solutions (RRS) siting that the withheld information included price mechanisms, volume allocations and proprietary contract tools and processes. The council argued that RRS operated in a competitive waste market and disclosure would allow competitors to work out the deal and how it was structured resulting in a loss of its competitive edge. The council went on to argue that the Sinfin waste sites novel nature has the capacity to become a "BEACON OF EXCELLENCE"
ENERGOS the developer of the incineration equipment being installed into this beacon of excellence had gone into administration in mid July 2016. It was suggested that the competitors of RRS would benefit from the unique know how contained within the information and thus undermine the ability of RRS to utilise this for its own benefit damaging its commercial interests. Other than the Derby, Glasgow and Milton Keynes projects that have moved ahead there is little evidence of other projects moving forward using such technology and in recent weeks a proposal to install similar tech on the Isle of Wight has been dropped - so not quite the beacon being suggested. The ICO asked the council to provide a new schedule setting out in each instance the councils rationale for withholding information so that it matched the specific parts of the documents. Having been given further time to do so the council advised it had approached RRS and Derbyshire County Council but that they had declined to provide any further arguments or clarification. The ICO in their ruling considered that the lack of clarity in the councils submissions suggests that the council either does not properly understand what the effects of disclosure would be or has struggled to meet the evidential and explanatory burden set by the exception. On 4th August 2016 the Information commissioner at the ICO RULED IN MY FAVOUR instructing Derby City Council to disclose the withheld information to myself as the complainant. In early September 2016 Derby City Council was in no mood to lose their battle again a resident of Derby so instructed its legal team to appeal the ICO ruling and so work started on a legal appeal. I as the original applicant was also in no mood to lose the battle and so registered as a party to the appeal which WAS set to be heard later in 2017 in London UK. After a delay of a number of months as two similar cases passed through the tribunal system the Derby case began to move forward. In recent months a similar case relating to an incineration plant in Gloucestershire and its associated contract pretty much ruled in the original applicants favour - while the council in that case attempted to put a brave face on things while putting some spin on the ruling the applicants in Gloucestershire are very happy with the result of their battle. A similar ruling regarding an incineration plant contract in Worcestershire also placed pressure on Derby City Council who were then set a date by the General Regulatory Chamber who were running the appeal by Derby City Council where the council had to acknowledge if it proposed to continue with their appeal. So two other appeals went against the local councils which forced Derby City Council into a corner over their appeal against the ICO ruling. Did they continue or did they rollover! The councils legal team made the following statements when terminating the councils appeal. "Our clients have been carrying out a fresh, detailed, careful and considered review of the disputed information with all interested parties taking into account the passage of time and developments since the initial request and the commencement of the Appeal. Having concluded that reassessment and made recommendations accordingly, the interested parties have respectively reached agreed conclusions and advised the relevant public authority which has been able to make an updated decision on disclosure as a result. Our clients have invested a great deal of time in reaching this decision and it is not one that has been taken lightly. Despite considering that much of the disputed information remains commercially sensitive and confidential, given the time that has now passed since the original request for information by the applicant and taking into consideration the current stage the facilities are now at, the likelihood of probable harm from disclosure of the disputed information into the public domain has reduced. As a result our clients have asked us to confirm that the disputed information will be disclosed in its entirety. " The council was simply playing with words - £20,000 was spent but the city council only paid a third of the payment! What are they trying to hide from the residents of Derby and Derbyshire ? 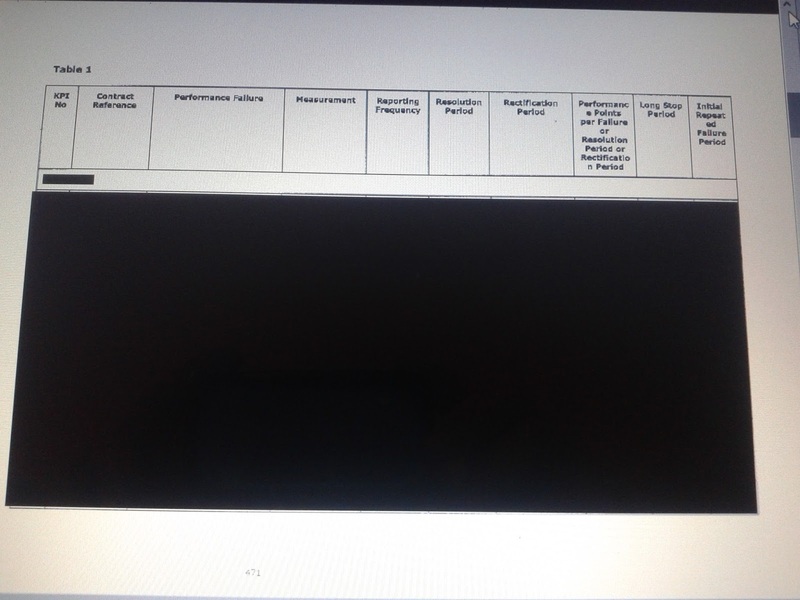 what is so controversial that they redact whole pages of their waste contract ? In these times of austerity and government cuts surely the public have a right to know what their taxes are being spent on. NOW WE HAVE THE CHANCE TO FIND OUT!